We've gathered all of our rectangular garden tables together, so if you haven't decided on a size or style, you've got all your options here on one page. We have extendable tables, modern style tables, side tables and steel bistro tables. Sizes range from 107cm BBQ side tables to 5 metre 16 seater sets. Whatever you choose, delivery is free. You won't find any extra charges when you reach the checkout page. Depending on the size of your garden table, we may even be able to get your order to you the very next day (see our delivery information page for more details). Browse our rectangular metal garden tables, choose the perfect one for you, and we'll make sure it gets to you as quickly as possible. The Janine table is a sleek and elegant piece of black metal garden furniture with an aluminium frame and glass table top. It seats 6 people, and is an extension table measuring 220cm when extended. This black garden table suits the dining room as well as it does the patio. Its toughened glass table top and cast aluminium frame enable it to cope comfortably when bad weather comes along. The Vanessa table is a 10 seater garden furniture set in a classic style. Its table top features gorgeous lattice patterning and an ornate, curved border. This fully cast aluminium extending garden table can function as a 6 seater, and adapt to seat an extra 4 people when needed. This has made the Vanessa table a popular choice for customers needing a functional garden table for both everyday use and hosting larger groups. If even 10 seats is not enough, don't worry. We have 12 seater rectangular garden furniture models like the Isabelle table and Deborah table available, and then there's the Madison table set. This 16 seater metal garden table is 520cm in length by 120cm. This stylish table features a simple lattice table top, with space to fit a parasol. A few of our garden tables in this category are tables only, but many are metal patio sets consisting of a table and chairs. You will find that these outdoor furniture sets come with not just one, but a choice of chairs. A default chair will always be available at no extra cost, but we offer some other chairs with different designs. If you prefer another chair, such as the Jane or Maria chair, you can pair it with your table for between £5 and £20 per chair. The chairs for our modern garden table sets combine cast aluminium with a hard wearing outdoor mesh fabric. If you're purchasing a table and chairs set, you'll have some fantastic, unique offers available to you. Your rectangular garden furniture set will be that much better when enhanced with a few accessories such as a parasol and seat cushions. Underneath the section where you choose your chairs, you’ll find offers for seat cushions and parasols in various colours. Purchasing these accessories alongside your rectangular cast aluminium garden table means you save 70% on them, compared to buying them separately, so don’t miss out! We’ve got other offers too. You can get between 20% and 80% off various aluminium garden furniture items such as garden benches and sun loungers. But these offers will be unique to this page, so combine them with your main order to take advantage. In general, we have some outstanding deals on our clearance page. These standalone deals apply to all kinds of outdoor furniture, from side tables to 12 seaters. They change all the time, so check back regularly, and if you see a bargain, get it while you can! If you're wondering what makes aluminium garden furniture special, it's a combination of factors. First and foremost, cast aluminium is weatherproof. It survives the elements a lot better than wooden or cast iron garden furniture. Wood must be sanded and coated in weatherproof paint or varnish to stop it from rotting or splitting. Cast iron is prone to rust. To prevent this, it needs to be covered or sheltered. Exterior metal paints are available too, but they often cover over the beautiful metal look that for which you bought it in the first place. Solid wood and cast iron are also particularly heavy. Cast aluminium is outstandingly light, which makes moving even larger tables a much easier task. 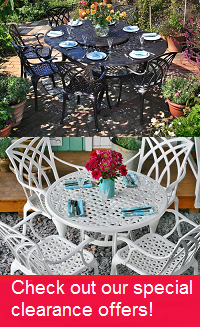 Overall, cast aluminium garden furniture is a solid choice. Leave it outside all year round without worrying, and move it around with ease. It looks great too, and we're pleased to offer the finest cast aluminium furniture pieces available.